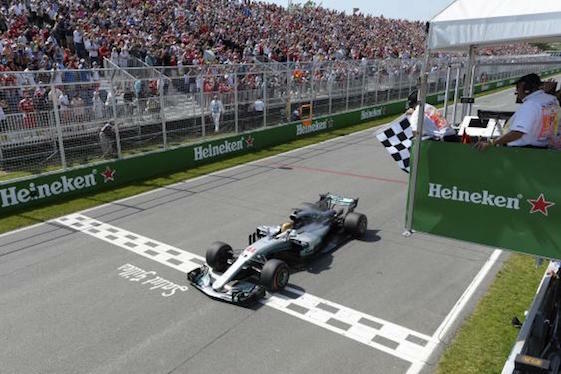 Britain’s Lewis Hamilton took the checkered flag in Montreal on Sunday. Hamilton started from the pole and ended by taking the checkered flag by 19.7 seconds over Mercedes AMG teammate Valttieri Botas. In between, Hamilton led every lap. Daniel Ricciardo of Red Bull Racing finished third. Charging from the back of the field after a first-lap incident with Max Verstappen sent him to the pits for a new front wing for his car to finish fourth was points-leader Sebastian Vettel of Ferrari. Vettel’s lead over Hamilton was cut to 12 points as a result of the Canadian race – 141-129. “It has been an incredible weekend and I couldn’t be happier,” the three-time world champion said after recording his sixth win in Canada. “The team came away from Monaco scratching their hands, but everyone just wanted to work and pull together, which we did. Force India driver Sergio Perez rounded out the top five. Haas F1 driver Romain Grosjean picked up a point by finishing 10th. His teammate, Kevin Magnussen, finished 12th.